Inside our canyons, protected among the 30-story walls, massive boulders and the many sycamore trees stand a dozen ancient pre-Columbian dwellings, caches, ceremonial centers, hunting lodges, ovens and sculpted deities. Inside many of these sites exist dozens of pictographs, each offering a diversity of cultural, religious and behavioral history. Scattered about our canyons, these sites, dated to 2,000 years ago, offer glimpses of the nomadic tribes that used to call the ranch home. Vigorously protected and conserved by our family for over 60 years and proclaimed national historic sites by Mexico’s famed National Museum of Anthropology, the ranch’s Native American ancient sites reflect the ranch’s rich history. To visit and explore the sites today is to visit and explore ourselves, to our beginnings, and our never-ending journey. For hundreds of years, ancient hunter-gatherers called our canyons home, relying on the land’s rich supply of plant and animal food for sustenance. Life 2,000 years ago was not easy, yet our canyon’s were home to these nomadic tribes. Many of the sites are located in the immediate vicinity of natural springs that, even today, run with crystal clear water. While the men of the tribe left to their hunting lodges, where they would set up camp for weeks at a time in search of game, the women, children and old men stayed behind, picking the rich and edible vegetation the land provided, ultimately responsible for the survival of the entire clan. Indeed, contemplating living 2,000 years ago, deep inside desert canyons, full of canopy, water and life, a virtual oasis, and all a tribe ever knew, is to travel back in time to what was surely a surreal time in human history. To visit the sites today, with very well preserved pictographs, ovens, walls and other artifacts that enable one to glimpse into the past lives of these tribes, is to be placed directly in the line of history, of our beginnings, of living in caves, surviving with what nature provided, traversing limitless obstacles, surviving and indeed thriving. For reasons not yet fully understood – some experts say through prolonged drought or resource exhaustion – the tribes eventually moved on, most likely heading south and continuing the great migration that brought thousands of humans, and many tribes, to the Americas. Beginning in Siberia, across into Alaska’s shores, and quickly spreading south, modern humans inhabited, in a few thousand years, points both north and south in the Americas, from Alaska and Canada to Argentina. 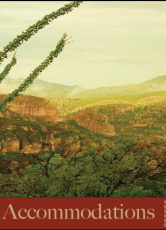 Our tribes, those that lived in the canyons of Rancho Los Baños, were only part of this great migration south, perhaps joining forces with other tribes, perhaps disappearing entirely, perhaps becoming the ancestors of the Aztecs themselves. Once they left the canyons, these peoples were lost to history. The art and cultural history they left behind, however, remind us of their existence, of their daily life, their struggles and triumphs. These tribes have, through their ancient relics and artifacts, been forever memorialized, and remembered. Richly preserved, these sites and their pictographs offer a historical and cultural adventure that is not to be missed. Whether reaching them by hiking or riding, or combining both, the majesty and cultural-historical richness of the sites will forever remain ingrained by the memories of an enchanting stay at Rancho Los Baños.